Notice: Undefined variable: month in spn_at_preprocess_page() (line 190 of /home/mblock/sustainabilitypractice.net/sites/all/themes/spn_at/template.php). Notice: Undefined variable: month in spn_at_preprocess_page() (line 191 of /home/mblock/sustainabilitypractice.net/sites/all/themes/spn_at/template.php). Michael Green’s Wood Innovation Design Center in British Columbia. Think of a modern cityscape and any number of materials come to mind: the glass and steel of an office tower, the stately brick and stone of a townhouse, the asphalt pavement and stark concrete canyons of 20th-century urban redevelopment. All of these have, at some time, heralded visions of the city’s future. Now, if a growing chorus of architects have their way, the next generation of urban buildings will be crafted from an innovative, versatile structural material that’s key to sustainable large-scale development. You’d know it as wood. In the quest to limit the energy and resource costs of construction, a number of global architects have begun designing and constructing modern buildings from a substance we now associate more with suburban homes. Thanks to novel composites, several multistory buildings have already been erected around the world with timber skeletons, and plans for taller buildings are in the works. They’ve been making a larger argument to the industry and to policy makers that to build cities with a lower environmental impact, wood is not just promising but necessary. It’s a plentiful resource that grows back relatively quickly, and even pulls carbon out of the atmosphere as it does. But its advocates are up against some significant obstacles. On this scale, the construction industry is set up to work in concrete and steel, and doesn’t change course easily. Architects are unaccustomed to envisioning their designs in timber. They also face building codes shaped by wood’s long record as a flammable material. In that sense, its advocates are fighting history in their effort to bring it back. The buildings they envision have been dubbed “plyscrapers.” Their halting arrival into the mainstream of architecture represents a test case for whether the goal of sustainability can motivate a reversal of both long-term construction norms and the laws that have grown around them. And in the long run, they also may offer the prospect of putting the look and feel of cities through a whole new transformation. Architectural firm Skidmore, Owings & Merrill reimagined a 42-story apartment tower it had built in the ’60s as a “timber tower,” replacing most of its concrete structure with wood. Using timber would reduce the building’s carbon footprint by 60 to 75 percent. In many parts of the world, timber long dominated urban streets. Wood was abundant, inexpensive and easy to work with. But it also had profound weaknesses. It was flammable, especially as it aged and dried: Whole downtowns would be gutted as fire swept through neighborhoods. The great fires in Chicago (1871), and London (1666) may be the best known, but most large cities went through catastrophic fires—Boston’s worst was 1872—and had to be rebuilt more than once. Wood also had structural weaknesses that limited the size of buildings. Anyone who has seen a house built knows what a wood frame looks like: a lightweight timber skeleton that might support a few stories, but lacks the strength for larger structures. And the heavy beams that supported 19th-century factories and warehouses came from old-growth forests that have long since been logged. What makes it possible to conceive of timber skyscrapers today is a generation of wood products that bear little resemblance to a two-by-four. Called “mass timber” for its size, the new family of materials consists of wood glued together into large prefabricated panels. One of the most widely used, cross-laminated timber, was first developed in Switzerland in the early 1990s, and further refined in Austria. It comes in panels up to nearly 20 inches thick, 18 feet wide, and 98 feet long. It binds multiple layers of wood with the grain running in perpendicular directions, creating a material that is strong, durable, and resistant to shrinking and swelling. At these dimensions, it also performs much better in fire tests; the outside chars, leaving the inner sheets intact longer. A mass timber beam can retain its strength longer in a fire than an unprotected steel beam. The primary argument for tall timber buildings is environmental. Though dense cities are relatively resource-efficient, tall buildings are uniquely costly when you consider the “embodied energy” of their materials—that went into producing, transporting, and installing them. “Concrete is particularly bad, steel’s not much better,” says Daniel Safarik, editor at the Council on Tall Buildings and Urban Habitat. Trees, on the other hand, can be replanted; the carbon locked into timber offsets the emissions required to harvest and process it. “It’s the only way you can build a carbon-neutral building from the outset,” says Vancouver architect Michael Green, who’s emerged as one the most avid advocates for wood construction. Energized by this prospect, architects have been trying out new timber structures. In 2009, the nine-story Stadthaus apartment building in East London became the tallest modern timber building in the world, and a 10-story apartment building in Melbourne, Australia, bested it in 2012. A 14-story tower is under construction in Norway. The buildings use wood panels much like concrete slabs to form their inner structure. Australia’s Forté building, for instance, has a concrete first story but the rest of its floors and shear walls were constructed from 759 cross-laminated timber panels, shipped from Austria flat-packed like a massive Ikea bookshelf. Closeup: The design uses prefabricated wood panels much like concrete slabs to form the main structural elements of the building; reinforced concrete is used only at joints to give the building stability. Architects want to push higher. 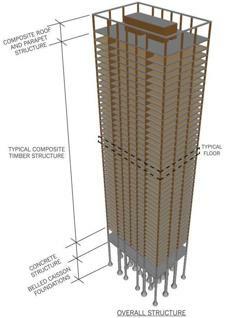 In 2012, Green published designs for wooden towers up to 30 stories. C.F. Moller Architects won a design competition with a planned 34-story wood skyscraper for Stockholm. And the global architectural heavyweight Skidmore, Owings & Merrill has a proposal for a 42-story tower with mass timber floors, columns, and shear walls joined together with steel-reinforced concrete joints. Perhaps surprisingly for a new material, wood isn’t more expensive to use. But embracing it on a grand scale would require several industries to change their status quo. Architects and engineers tend to stick to familiar approaches; a new type of material would involve entirely new supply chains, skills, and techniques. “The construction industry doesn’t really have a playbook for this,” says Safarik. Wood has gotten a practical boost from governments and industry in timber-rich places like Austria, Scandinavia, and British Columbia—although in British Columbia, the concrete and steel building lobbies have fought back against the province’s “wood first” policy. And the US Department of Agriculture this March launched a competition for wooden high-rise designs and announced a $1 million investment to train architects and builders to work with wood. Even if practical considerations are worked out, there’s still an important hurdle. Building codes in the United States limit wooden structures over about six floors, and cities have restrictions of their own. The disappearance of wood from cities has been a centuries-long process. Boston’s first fire ordinance in 1631 banned thatched roofs and wooden chimneys, and codes prohibiting wood in taller buildings arose in the last half of the 19th century. It was the need to find fire-resistant replacements that drove the embrace of the building materials we now associate with cities, says Sara Wermiel, a research affiliate at MIT who has studied the history of fireproofed buildings. Only later were the materials used to create new taller designs that altered urban skylines. Because mass timber products are relatively new, they aren’t officially recognized in US building codes. Projects that use them rely on an “alternative means and methods” category. That’s beginning to change: The 2015 International Building Code, the most widely used in the United States, will recognize cross-laminated timber as a building material for the first time. But not everyone is convinced that tall timber buildings are a smart move. “The fire service is definitely very concerned about it,” says Amanda Kimball, research project manager at the Fire Protection Research Foundation in Quincy. As his observation suggests, returning to wood could reshape the city as dramatically as the move away from it. It wouldn’t happen quickly; many of today’s mass timber structures look like normal apartment towers from the outside. “I think that’s a tragedy,” says Green, who uses exposed wood liberally in his buildings, including the nearly completed Wood Innovation Design Center in British Columbia, the tallest modern timber building in North America at 90 feet. “I think we gravitate towards natural materials, especially wood,” he says. The wood composites in his buildings may look more constructed than thick timber posts of yore, but still exude a warmth absent from other manufactured materials. And a new question arises: After spending so much time in cities of steel and concrete, how would we respond to a skyscraper with a grain? Courtney Humphries is a freelance writer in Boston. “Urban Timber” runs through Sept. 30 at the BSA Space in Boston. 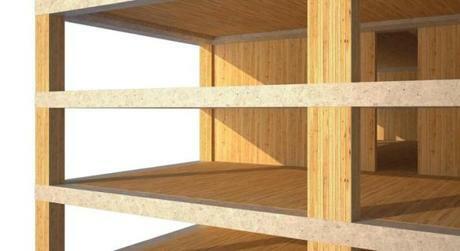 Cross-laminated Timber: the Future of Building?